Here is the derivation of an analytic formula to calculates the minimum distance or great circle distance between any two arbitrary points on the sphere of a finite radius. 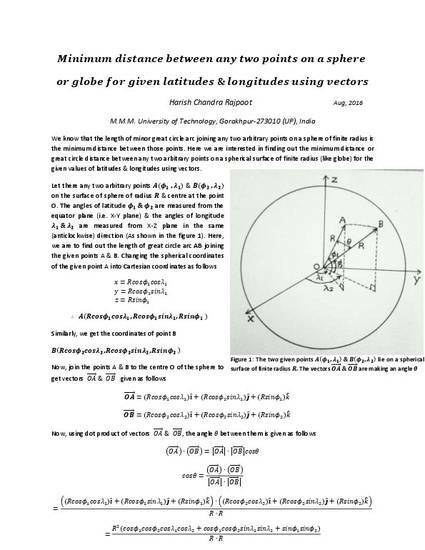 This formula is extremely useful to calculate the geographical distance between any two points on the globe for the given latitudes & longitudes. This is a highly precision formula which gives the correct values for all the distances on the tiny sphere as well as the large sphere like giant planet if the calculations are made precisely. It is important formula in global positioning system (GPS) to precisely measure the minimum distance or great circle distance between two arbitrary points using latitudes & longitudes.